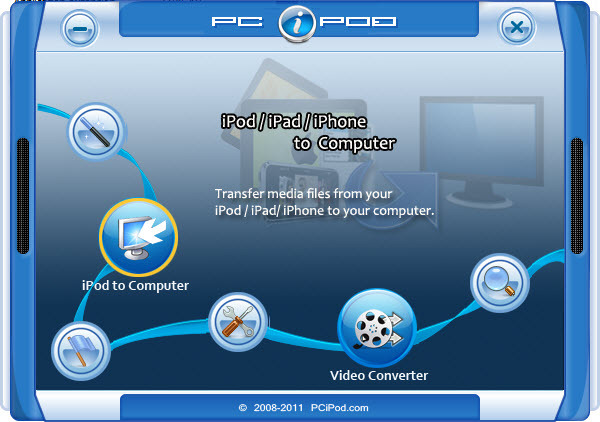 PC iPod Basic provides a fast and easy way to transfer music and video files between your computer and iPod / iPhone. Do you need an easier way to move your music and movies from computer to iPod/iPhone ? Do you have no idea how to get music and videos off the iPod back to the computer? PC iPod Basic is an easy solution for you! With just one click, you can easily transfer music and videos from the PC to iPod/iPhone. Free your iPod Now! PC iPod Basic searches for a removable drive containing an 'iPod_Control\iTunesDB' file to detect your iPod. If your iPod has just been restored, it may not have the required files for PCiPod to know the drive is an iPod. Please run iTunes, which will correctly initialize your iPod with all the required files. Qweas is providing links to PC iPod Basic 3.0.2 as a courtesy, and makes no representations regarding PC iPod Basic or any other applications or any information related thereto. Any questions, complaints or claims regarding this application PC iPod Basic 3.0.2 must be directed to the appropriate software vendor.